Here are a few tunes from my sextet gig at the PDX Jazz Festival. Someone wrote to ask me if I had a a transcription of Trane's solo on Crescent (one of my favorite albums of all-time). My buddy happened to have it in one of the Andrew White transcription books that he copied from the Berklee library. Andrew White is a an overachieving madman who transcribed almost every single solo that Trane ever recorded and self-produced over 48 albums. You can order these transcriptions from Andrew's catalog, though I had a difficult time trying to find his website. 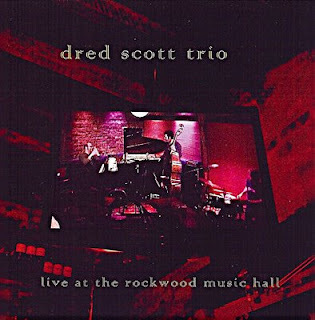 I met pianist Dred Scott when I moved back to the Bay Area from Boston in the early 90's . I co-led a quintet with saxophonist Kenny Brooks for several years. Dred was the pianist, Kenny Wollesen played drums and when he was available Larry Grenadier played bass. Dred had moved to Oakland from Akron with his trio, which he called Third Plane. This trio had something special. Their music, which was composed mostly by Dred, crossed stylistic boundaries and was truly electrifying. I became a huge Third Plane fan immediately. There aren't a lot of musicians that I know who I would consider to be true musical geniuses, but Dred would be one of them. One day Dred decided to pick up the drums. A few days later we were playing with Charlie Hunter on the street and just a few months after that he was playing in clubs, and sounding better than many drummers who had been playing for decades. Dred moved to New York City several years ago seems to have really carved out his own niche there. He just released a live trio recording on the Ropadope label, but he also is offering free downloads of a full tune from the album. In Jerry Bergonzi's book on pentatonics he has a recorded example of himself demonstrating the use of mixed pentatonics. My buddy Dave McGillicuddy transcribed Jerry's example in order to see clearly what he was doing.